Successfully Added Car Cup USB Charger - Dual USB Port, Dual 80W Cigarette Output, 45CM Cable, LED Display, Explosion-Proof (Black) to your Shopping Cart. Never run out of juice again while waiting to reach your next destination during your upcoming road trips with this useful car cup charger. Simply plug it into your car cigarette output and you will be able to transfer your car’s energy straight to your mobile devices such as your smartphone or tablet. Supporting two USB outputs and two additional 80W cigarette outputs, this car USB charger is a truly multifunctional device that can be used to charge numerous of electronics at once. Its dual USB ports let you plug in your smartphone or tablet, allowing you to watch movies, play games, and browse the web for hours in a row without ever again needing to worry about running out of juice. No longer do your children or passengers in the back of the car need to be bored while waiting to reach the upcoming holiday destination. Simply plug in your mobile device into this car charger and your passengers will be treated with an unlimited power supply to enjoy all their smartphone and tablet features non-stop. 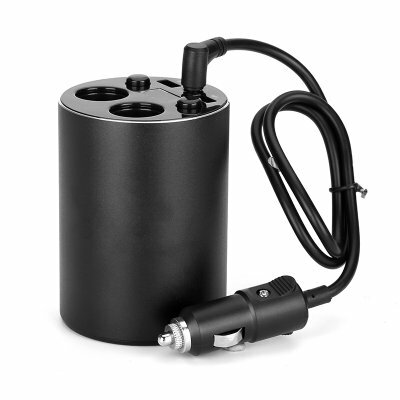 Besides its two USB ports, this car charger furthermore features two additional 80W cigarette outputs that can be used to power up additional car accessories such as a van. Coming with a 45CM power cable, this USB charger for in your car has enough range to serve people sitting both in the front and back of your car. Crafted out of high-end and heat-resistant material, this aluminum car cup charger is safe to be used for countless hours continuously. Its protection against power surges, short circuits, and overheating assures a safe usage – allowing you to charge all your devices throughout the entire trip without needing to worry about damaging your USB car charger. This car cup charger comes with a 12 months warranty, brought to you by the leader in electronic devices as well as wholesale electronic gadgets..